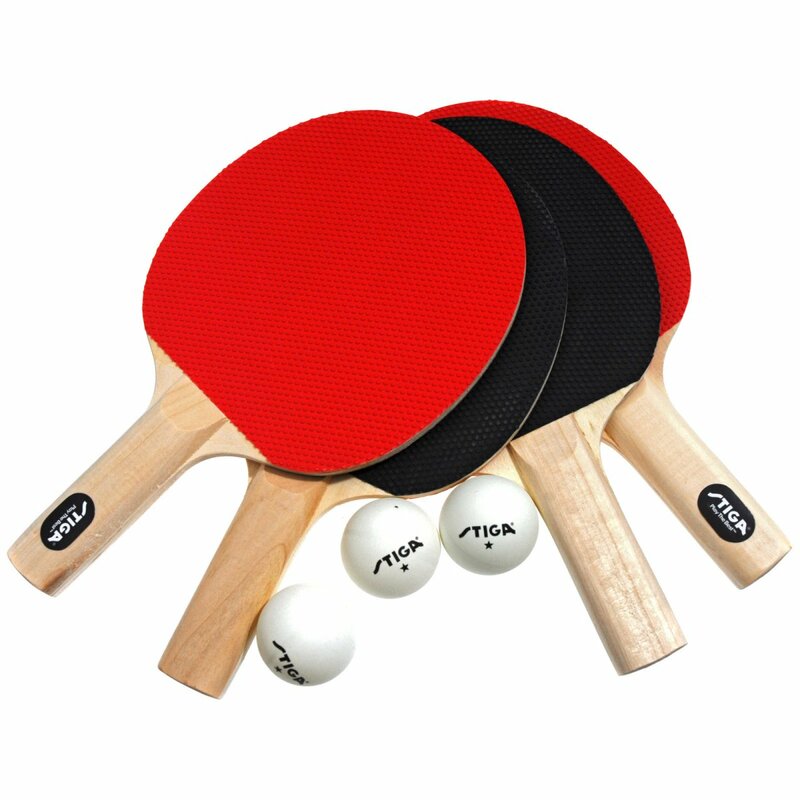 This is the summary of consumer reviews for Park & Sun Mini Table Tennis Set. The BoolPool rating for this product is Good, with 3.70 stars, and the price range is $99.75-$129.99. lots of fun.....perfect size for a condo! Table is lots of fun. 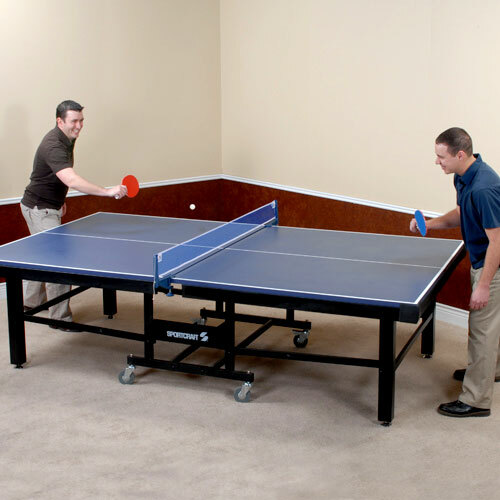 The table is perfect size to play on and for storage. Sporting tournaments the kids/parents have fun between games. The product itself is very well made and it provides a lot of fun for everyone. It's a lot of fun and I look forward to using it for a long time. I agree with other reviewers that it's a little hard to get used to the small size, but the table seems to be sturdy and with practice we'll be successful playing on the smaller sized table. We don't have room for a full size one. i dont have space for a large table, but this mini is a lot of fun for my wife and me. it arrived in perfect condition, too. We've a very small home and this's just the perfect size. My husband and 3 yr old son love it! It's great for adults (my grown children love it), and for kids also, as my six year old granddaughter loves it too!.It more than met my expectations and is a great product and price. The grandkids love the Mini Table Tennis Set. I bought this product online and was disappointed when assembling it. I bought table for my two boy's ...they love it!! !Its easy to move table everywhere ..its feet in my living room so good ....they send me table so fast!I just love it...even me and my husband play sometimes :)!Thank you!!!!. loved the product but was upset at the shape in which we received the product the top of the board had several knicks in it. Product and delivery - very good. I read all reviews on this product and order anyway. My husband managed to fix it with new screws and the kids enjoy playing with it. A couple of the screws had fallen out in transit like others mention in their reviews, but it was easy to just screw them back in and set the table up for play.Note that the table is great for singles but not really wide enough to play doubles on. This's for my 7-12 year old, Daycare kids, it keeps them activite for hours, and my family enjoy playing on the tennis table also. I bought this for the kids to play with in the backyard. 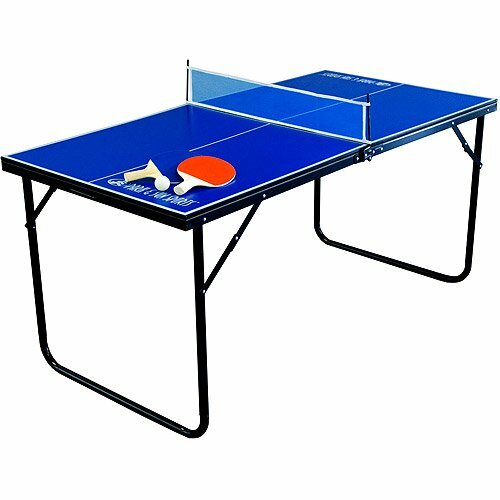 This mini table tennis let's me and my husband get to play even in our spare room and still have space to move around. Light enough for me to take inside or outside if my husband isn't at home and we need to play some games. If you've played on a regular table, you'll get used to the size pretty quick. We attached the net, simple installation and started playing. She got the better of me. My 9 year old son and 6 year old daughter had a blast playing. My only other complaint is that if you want to fold up the table for storage, the playing surfce is on he outside. 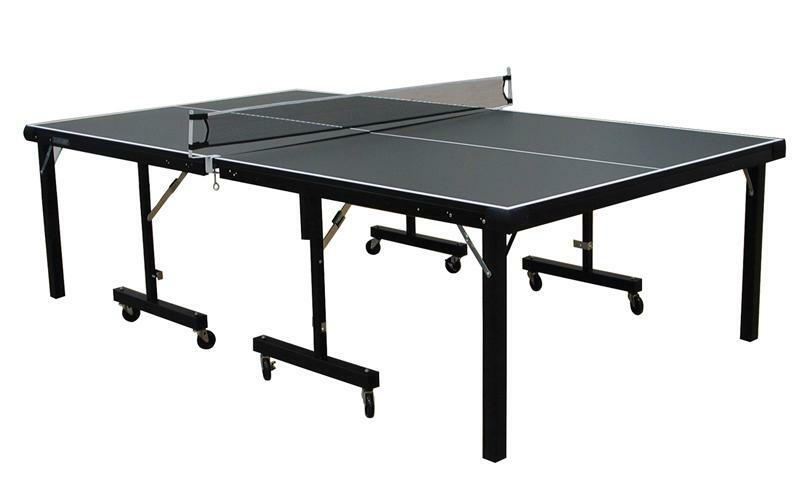 Great ping pong table for small area--great price!. 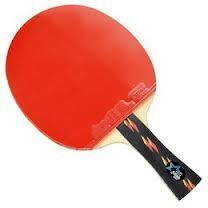 Christmas Eve was so much fun playing ping pong. 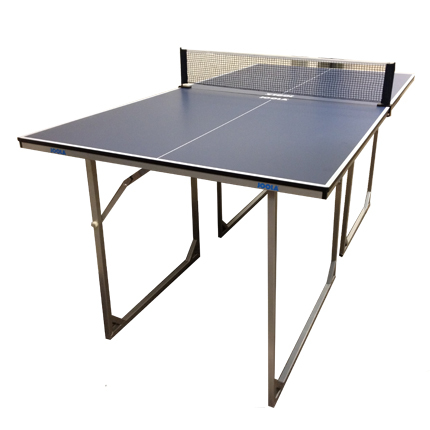 A very nice ping pong table for the price. 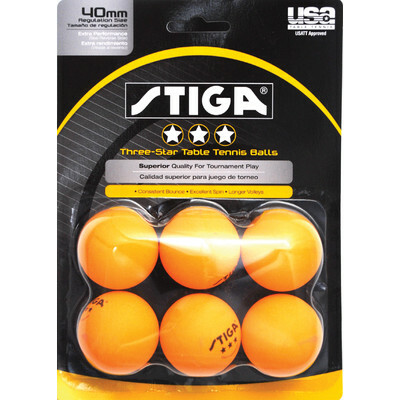 The balls aren't regular ping pong balls. They're heavier and don't bounce like a ping pong ball. 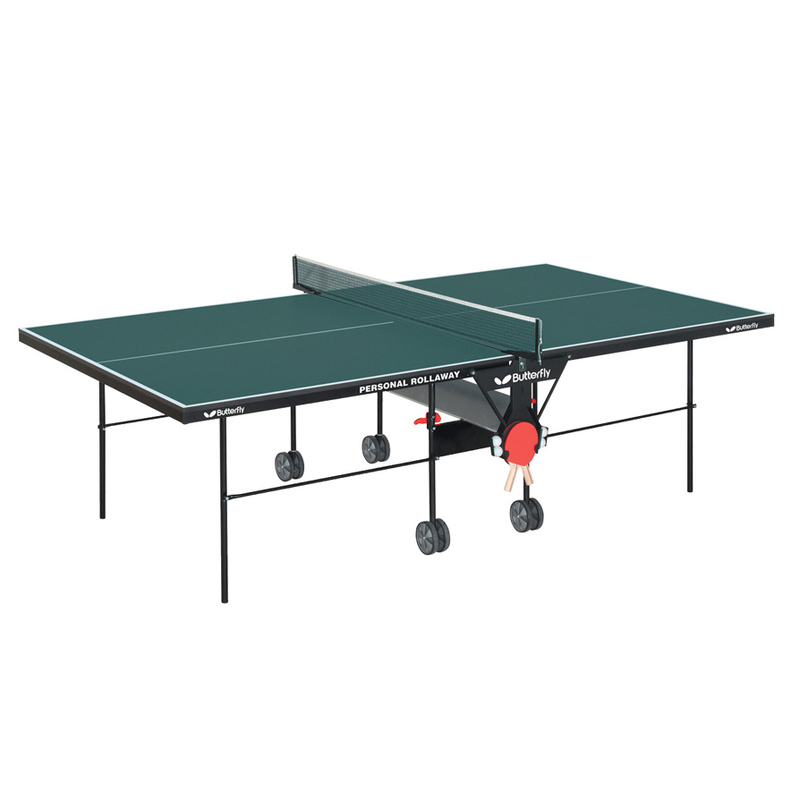 This's a great mini ping pong table for rooms that aren't large enough for a fullsize version. There was no way we were going to fit a ping pong table anywhere in our house. 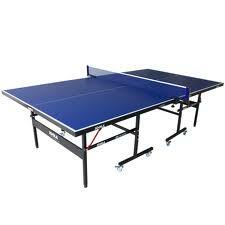 It folds in half so my daughter can take it with her.I'd strongly recommend the ping pong table for anyone who's looking to have some fun without the expense and size of a larger table. we don't have the space for a big ping pong table so this works great for our kids. If you're used to using a fullsize ping pong table, it takes a little to get used to. The table top is screwed into a frame, but they've used extremely small screws and the table top is compressed wood, so in transit these screws came out. Table arrived with no damage or screws missing. We couldn't even screw some back in because the holes were stripped to the screw wouldn't get tight. When I received and opened the (undamaged)box, there were screws everywhere, loose in the box. I attempted to simply screw the loose tabletop into the base myself but it was impossible because the screws were stripped. We just opened the box, put the net on, and was ready to play Christmas morning. There weren't any screws missing or loose. Just as another buyer mentioned, as soon as I opened the box screws and washers flew out all over the place. My biggest complaint is that the short wood screws they use come out easily. Upon removing the table from the two boxes it comes in, at least eight loose screws came tumbling out.